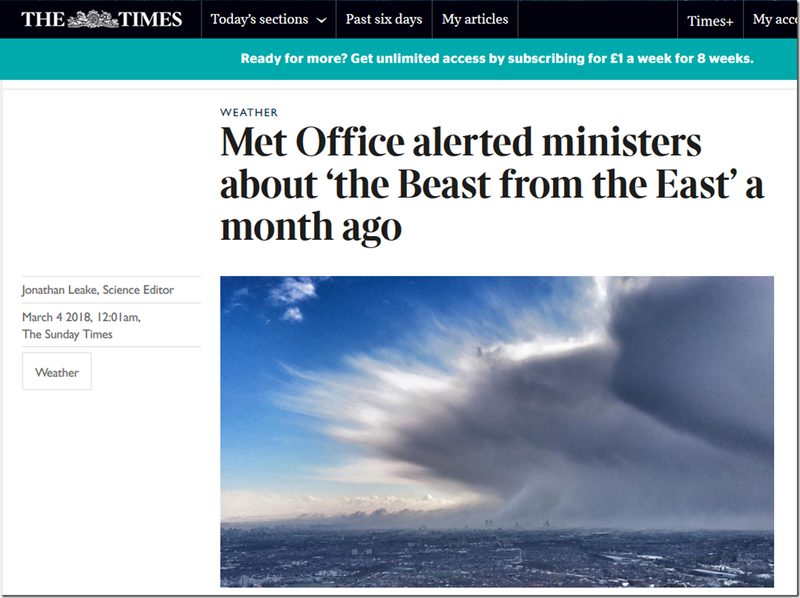 Britain’s freezing “Beast from the East” exploded into life thousands of miles away, in the tropical waters of the western Pacific — and ministers were warned that it was coming a month ago. Adam Scaife, head of long-range forecasting at the Met Office, briefed the Cabinet Office four weeks ago, warning of a freeze. He was confident enough to stock up his home with extra supplies. “I got extra oil, food and logs in, knowing this was coming,” he said last week. ← Claire Perry Hails “Soaring Success Of Renewables”! You won’t get an answer. It all goes into the ether. Paul Homewood is already getting answers but he is more tenacious than most. The question seems to be more whether any action will be taken – which is much more questionable. You can be certain that were it a climate sceptic being found out then action would be swift.